We offer a variety of staining dishes and Coplin jars suitable for staining in pathology, microscopy, microbiology and hematology. Staining is a contrast-enhancing procedure used to prepare samples for microscopic examination. In light microscopy, specimens are colored using various dyes, many of which are selective; that is, they stain a specific type of tissue, bacteria, or cellular component. Several stains may be used in sequence to produce a counterstained sample. Stains are classified as acidic, basic or neutral, depending on the nature of the stain's colored radicals. Acidic stains tend to react with cytoplasm, whereas basic stains are taken up by nucleic acids. In electron microscopy, the term "staining" may be applied to procedures wherein electron-dense materials such as salts or osmium, uranium and lead bind to and increase the electron density of various cell constituents. For example, Aniline Blue is an acidic, water-soluble dye used to stain connective tissue. This dye is valuable for visualizing connective tissue fibers beneath epithelia within glands and muscles. Aniline Blue colors collagen fiber dark blue, mucous and cartilage matrix light blue, and nerve tissue lilac. It can be used as a counterstain with red nuclear dye. Concentrations as low as +/-1% can be used to evaluate thick sections of resin-embedded material for electron microscopy. Dishes, covers and racks are manufactured from soda-lime glass and resist stains from Eosin or Hemotoxylin. Staining dishes are available in many configurations to accommodate up to 50 slides, with various glass and stainless steel racks. Coplin jars can be used for pre-staining with and alcohol buffer. Slides are held vertically for easy manipulation. 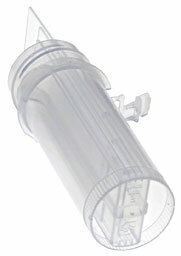 A Coplin jar can also serve as a preparation chamber for micro-thin-layer chromatography. Wheaton® staining dishes have been used for a variety of procedures to clean slides and coat them with a variety of materials (for example, Bain, J.R.; Hoffman, A.S. Glycophase glass revisited: Protein adsorption and cell growth on glass surfaces bearing immobilized monosaccharides, Biomaterials, in press 2002). 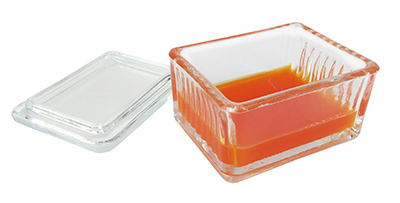 Wheaton® staining dishes have also been used for poly lysine and silane slide coatings. Note: Wheaton® staining dishes are not autoclavable or microwaveable, and are not intended for use at temperatures below 15°C or above 80°C. These mix-and-match components offer greater flexibility in meeting your requirements. 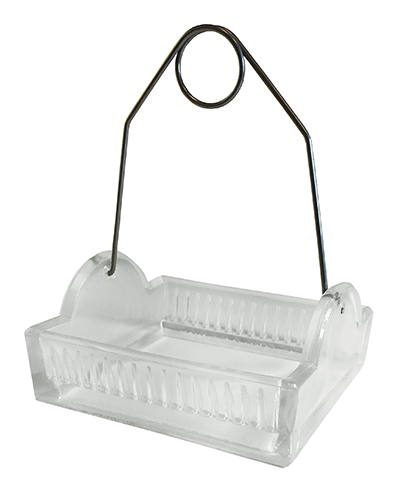 This staining dish accommodates 16, 30 and 40 slide racks, listed below. Manufactured from Wheaton® soda lime glass. Approximate inside dimensions (L x W x H): 120 x 90 x 70mm (4.72" x 3.54" x 2.75"). 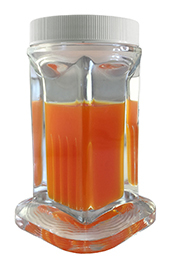 Maximum liquid volume without rack is approximately 650 ml. 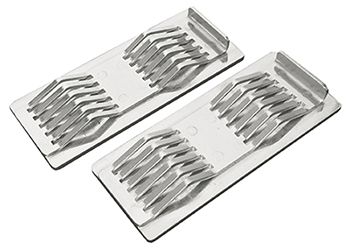 Slotted rack is designed to hold 30 microscope slides 3" x 1" (75 x 25mm), 3" x 1-1/2" (75 x 38mm), and 3" x 2" (75 x 51mm). The rack is made of non-tarnishable 304 stainless steel and is chemical resistant. Handle is permanently attached, but hinged to permit closure of dish and easy insertion and removal of the microscope slides. 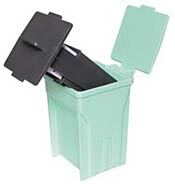 Xylene Recycling Pads were developed to allow extended use of xylene. Reusable and long-lasting, Xylene Recycling Pads work on the stain line while specimens are being processed. Available for all brands and styles of automated and hand staining systems; simply match the size of the pad to the size of your reagent vessel. Help to remove stains, dyes, alcohol and water from xylene and xylene substitutes. Guaranteed to save money, time, and energy in your laboratory while helping to produce less chemical waste. For xylene and xylene substitutes. Sized to fit most staining reagent containers. Note: Not for use with xylene used for deparaffinization. The Glass Rack holds 16 single slides, 31 slides arranged alternately straight across and diagonally, or 32 slides back-to-back. Holds 20 single slides or 40 back to back of regular 3" x 1" (75 x 25mm) size, 3" x 1-1/2" (75 x 38mm) and 3" x 2" (75 x 51mm) sizes. 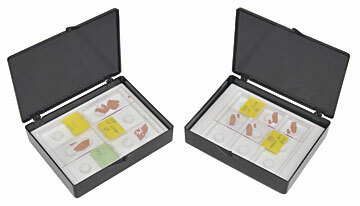 For staining 3 x 1" (75 x 25mm) microscope slides. Holds 10 single slides, 19 slides arranged alternately straight across and diagonally, or 20 slides back-to-back. Made of soda lime glass. Approximate inside dimensions: 77 x 60 x 30mm (3" x 2-3/8" x 1-3/16"). Maximum liquid volume without rack is approximately 150 ml. The wide top makes this jar especially suitable for staining slides inscribed on one end. Holds 8 single 3 x 1" (75 x 25mm) slides vertically or 16 slides back-to-back. Made of soda lime glass. Approximate inside dimensions: 90 x 50 x 30mm (3.5" x 2" x 1.18"). Holds about 50ml of liquid. For staining or use as a TLC developing chamber. Holds 8 individual 3" x 1" (75 x 25mm) slides. If necessary, 16 slides can be accommodated back-to-back. Made of soda lime glass. Approximate inside dimensions: 75 x 80 x 30mm (3" x 3.14" x 1.18"). 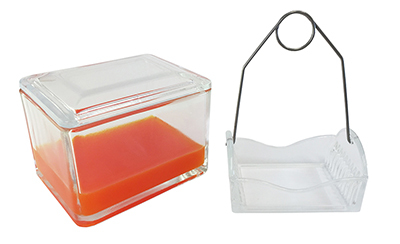 A popular staining jar with heavy glass walls and broad base for increased stability. Holds 5 single 3" x 1" (75 x 25mm) slides vertically or 10 slides back to back. Requires small reagent volume. Made of soda lime glass. Approximate inside dimensions: 75 x 30 x 30mm (3" x 1.18" x 1.18"). Holds 5 single 3" x 1" (75 x 25mm) slides or 10 back to back. Slides extend above the opening, permitting them to be manipulated without forceps. Screw cap is linerless, white polypropylene. 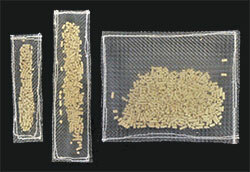 The white linerless polypropylene Screw cap closure retains organic solvents and reduces evaporation. Rectangular base. Made of soda lime glass. Approximate inside dimensions: 65 x 30 x 30mm (2.6" x 1.18" x 1.18"). Holds about 50ml of liquid. 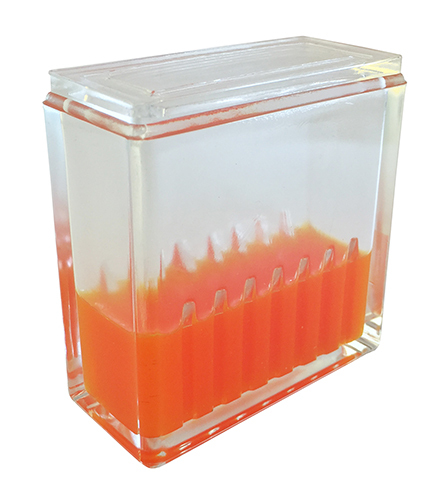 For staining slides or use as a developing chamber in thin layer chromatography. Unit holds 5 single 3" x 1" (75 x 25mm) slides vertically or 10 slides back-to-back. 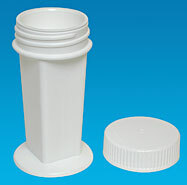 Screw cap is white linerless polypropylene which reduces solvent evaporation. Rectangular base. Made of soda lime glass. Approximate inside dimensions: 70 x 30 x 30mm (2.75" x 1.18" x 1.18"). 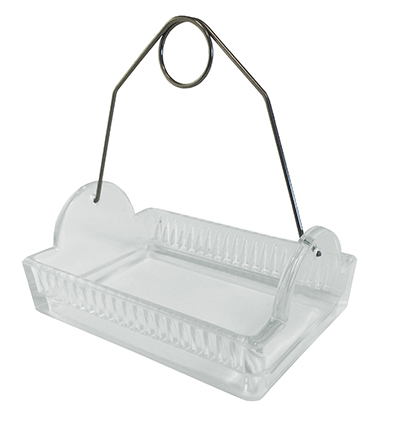 Holds up to five each 3" x 1" (25 x 75mm) slides and fits Coplin Jars and round-mouthed staining jars. Molded plastic withstands chemicals used in staining including special stains and metals. Can be used in temperatures up to 80°C. Chamber with extra tall lid accepts five single 3" x 1" (75 x 25mm) and 3.94" x 1" (100 x 25mm) slides. Made of soda lime glass. Meets USP Type 1 standards. Tapered, square with flat shallow threaded screw cap. Holds either 5 single or 10 back-to-back standard 3" x 1" (75 x 25mm) slides in grooves. Loosen lid before autoclaving. 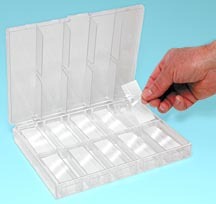 Polypropylene staining jar holds either 5 single or 10 back-to-back standard 3" x 1" (75 x 25mm) slides. The interior is grooved to hold the slides in and upright position. Domed and shallow thread cap provides protection to the slides. Loosen lid before autoclaving. Sold in package of 4. Accommodates 10 slides, 3" x 1" (75 x 25mm), one per slot. Rectangular top, snap-lock lid, internal grooves. Microwave Safe Jar. Has a vent in the lid. Remove foam seal when used in a microwave. Accommodates 10 slides, 3" x 1" (75 x 25mm), one per slot. Rectangular top, snap-lock lid, reagent proof seal, internal grooves, Bench Staining Jar. Has no vent in the lid. 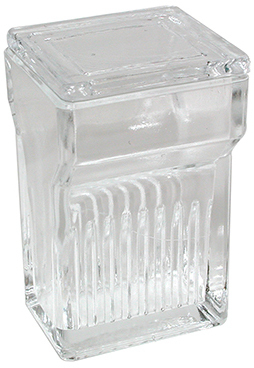 Glass jar with ground glass cover, accommodates 8 each back-to-back size 18 x 18mm coverslips. 45mm high. 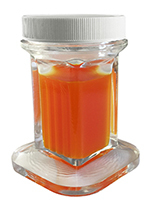 This staining jar can hold up to 4 cover slips measuring 17-23mm wide, and up to 30mm long. Longer coverslips can be accommodated by removing the cap. 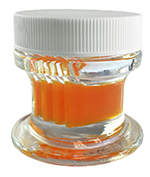 The jar comes with a white polypropylene screw cap with a PTFE coated polyethylene liner. It is manufactured from Wheaton® soda lime glass, which meets USP type III standards, and is resistant to most chemicals. This unique staining device is a breakthrough in cost-savings for immunohistochemistry. For the first time it is possible to create a capillary gap for slides or coverslips using one simple device. There are no expensive consumables, as with other products. The design of the PELCO Stain Saver™ will limit the amount of precious antibody to less than 200ul for a 22 x 22mm (#2 thickness) coverslip-sized area. 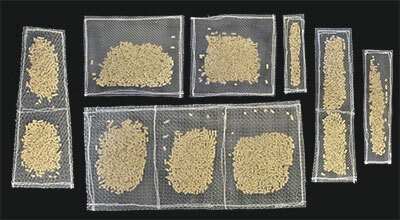 Total stainable area on a slide or coverslip can be up to 24 x 50mm (21092). Either design will accommodate round or square coverslips. The tissue to be labeled can be on a coverslip or slide because both are employed to create a uniform capillary gap. The unique adhesive properties of the mesas, in the design of the PELCO Stain Saver™, provide adhesion of either Thermanox or glass coverslips to the mesa tops. For conventional immunohistochemistry (overnight or longer incubations) the PELCO® Storage Box serves as an ideal humid chamber (2239-6 holds 1 PELCO Stain Saver™ and the 2239-2 holds 4). 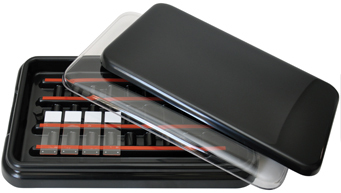 Each kit contains a staining pad insert inside a black box (21092-2 Medium Black Plastic Box, styrene. T-1 and 2 kits will accommodate 3 each 1" x 3" or 1 each 2" x 3" slides. The capillary gap with a #2 coverslip is 320µm. 2249-6 - 2249-2 The Polypropylene Humid Chambers are a convenient and economical way to create a humid environment for slides, PELCO Stain Saver™ Kits or other slide applications. The chambers are made from sturdy, impact resistant polypropylene with a sealing lid and a polystyrene insert to place slides, PELCO Stain Saver™ Kits or coverslips above the water level. The Sequenza Slide Rack, holding 10 glass slides and Coverplates, is a system designed for the immunolabeling of sections on glass slides. While originally designed for bench techniques, this system is uniquely suited for microwave-assisted applications. 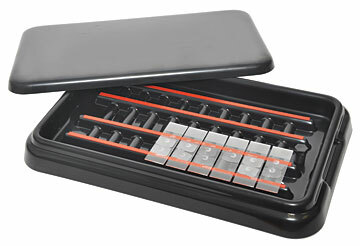 The Slide Rack holds glass slides with a Coverplate. This combination forms a capillary gap between the slide and the plate. Reagent volumes, especially antibody, are greatly reduced using this versatile system. 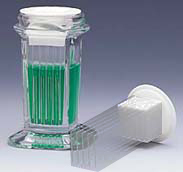 A reagent hopper forms the uppermost part of the plastic Coverplate allowing for easy dispensing of reagent into the capillary gap. Using a PELCO® Microwave Processor with a PELCO ColdSpot®, rapid immunostaining of sections on glass slides is reliable and easy. Go to the Immunolabeling Application Kit for the PELCO BioWave® Pro. Clean with 10% bleach solution and rinse with well water. 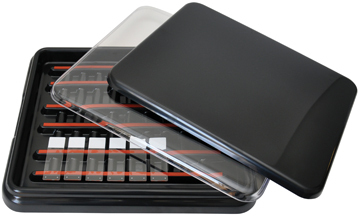 Sequenza Slide Rack and Coverplate system is not dishwasher safe. This is a low-cost, high precision moisture chamber for ten slides. Every moisture chamber is divided into ten individual compartments with approximately 12.7mm (1/2") empty space between the compartments. 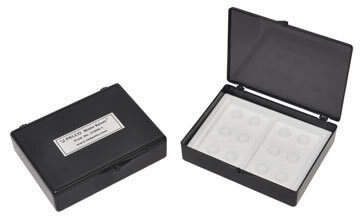 When the chamber lid is closed, eight barrier dividers are placed into the empty spaces between the microscope slide compartments completely isolating all compartments. This is a very desirable feature when doing immunostaining. The microscope slides are placed on four pedestal posts and four corner posts each 11.5mm (0.460") high, thus raising the surface of the slides approximately 12.7mm (1/2") off the floor to keep the slides away from the water below and making the slides easily retrievable (either by hand or by forcep). The chamber is fabricated out of heavy-duty polystyrene with an air-tight design to keep moisture in. 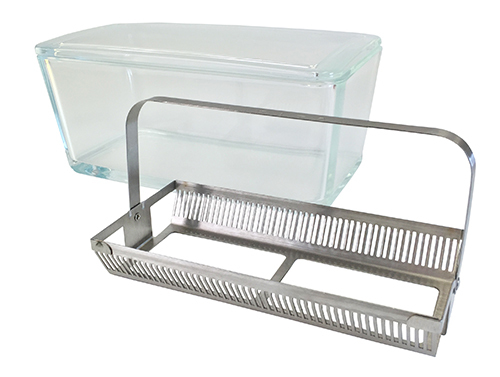 The chamber is designed to be stackable in order to save counter and/or refrigerator space. 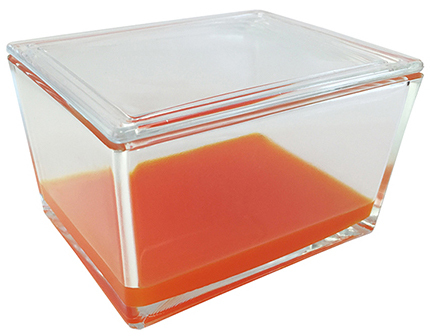 The StainTray™ is a versatile staining chamber for immunohistochemistry, routine and light-sensitive stains. 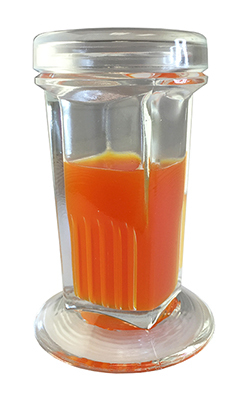 The unique design allows water to be added in order to create a stable humidity chamber. The chamber may also be left empty and act as a waste reservoir during solution changes. 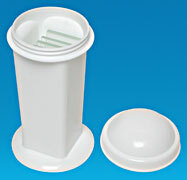 There is a convenient drain plug for easy emptying of the base tray. Both the black base and black lid offer a light-safe environment for any light-sensitive stains. 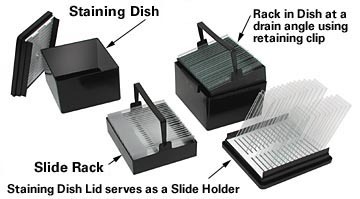 The StainTray™ base is constructed of sturdy ABS plastic and contains 4 plastic rails, each with a silicone strip to ensure your slides adhere securely in the tray. The rails are raised to prevent interference from the water or waste in the reservoir and to make the slides easier to retrieve. The four rubber feet give greater stability to the base during staining. The units are stackable for more convenient storage. 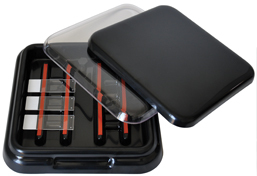 The StainTray™ offers multiple staining options that can be ideal for histology as well as hematology, cytology and microbiology laboratories. Background staining or non specific staining is a common problem in immunohistochemistry, immunofluorescence and in-situ probe staining reducing the signal to noise ratio. Background Buster is a peptide blocker that eradicates all general background staining caused by primary antibodies, staining reagents, chromogens, fixatives, and endogenous biotin. Background Buster is used in place of normal sera and other blocking agents for removing background in both animal and human tissue staining. Eradicating background, thereby increasing the signal to noise ratio is important for obtaining background free specific staining for the ease of qualitative and quantitative evaluation of staining procedures. Note: Nonspecific staining due to red blood cells is caused by endogenous peroxide enzyme in the red blood cells. This type of background requires a pre-treatment step with 3% hydrogen peroxide in water. This blocking step should precede the blocking step with Background Buster.